Digital divide between Latinos and Whites is smaller than a few years ago. WASHINGTON D.C. -- Latinos own smartphones, go online from a mobile device and use social networking sites at similar, and sometimes higher, rates than do other groups of Americans, according to a new analysis of three Pew Research Center surveys. 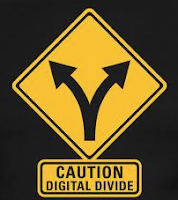 The analysis also finds that when it comes to using the internet, the digital divide between Latinos and whites is smaller than what it had been just a few years ago. Between 2009 and 2012, the share of Latino adults who say they go online at least occasionally increased from 64% to 78%. Among whites, internet use rates also increased, but only by half as much (80% in 2009 to 87% in 2012). Among the biggest drivers of these increases are spikes in technology adoption among foreign-born Latinos and Spanish-dominant Latinos. Both groups' rates of going online and of owning cellphones increased sharply since 2009, helping to reduce the digital divide between Latinos and whites and also reducing gaps within the Latino community itself. Cellphone Ownership: Fully 86% of Latinos say they own a cellphone, a share similar to that of whites (84%) and blacks (90%). Among Latinos who do not own cellphones, 76% are foreign born and 24% are native born. Smartphone Ownership: Among adults, Latinos (49%) are just as likely as whites (46%) or blacks (50%) to own a smartphone. Going Online from a Mobile Device: Latino internet users are more likely than white internet users to say they go online using a mobile device (76% versus 60%). Black internet users are equally as likely as Latinos to access the internet from a mobile device. Social Networking: Among internet users, similar shares of Latinos (68%), whites (66%) and blacks (69%) say they use social networking sites like Twitter and Facebook at least occasionally. Among Latinos who use social networking sites, 60% say they do so mostly or only in English, 29% say they do so mostly or only in Spanish and 11% say they use English and Spanish equally. Computer Ownership: Some 72% of Latinos say they own a desktop or laptop computer, compared with 83% of whites. Among blacks, 70% are computer owners. Half of Hispanic computer owners are foreign born. By comparison, 73% of Hispanics who do not own a computer are foreign born. Internet Use: Nearly eight-in-ten (78%) Latino adults go online at least occasionally, compared with 87% of whites and 78% of blacks. Half (50%) of Hispanic internet users are native born and half are foreign born. The report, "Closing the Digital Divide: Latinos and Technology Adoption," was written by Mark Hugo Lopez, associate director of the Pew Hispanic Center; Ana Gonzalez-Barrera, research associate with the Pew Hispanic Center; and Eileen Patten, research assistant with the Pew Research Center's Social & Demographic Trends Project. It is available at the Pew Research Center's website, www.pewresearch.org.